Aciex goes beyond common energy conservation measures (ECMs). It is the next level of energy management system that is needed to cope with the ever increasing demands how energy is used. Aciex incorporates the full spectrum of energy management tools needed to deal with the current complexities of energy management strategies such as, demand control, demand response, dynamic or real-time pricing, controlling renewables and distributed energy resources, or micro grids. Emacx Systems, Inc. is a real-time energy management software and technology company providing the next generation of Demand Side Management (DSM) solutions to energy intensive businesses in North America. 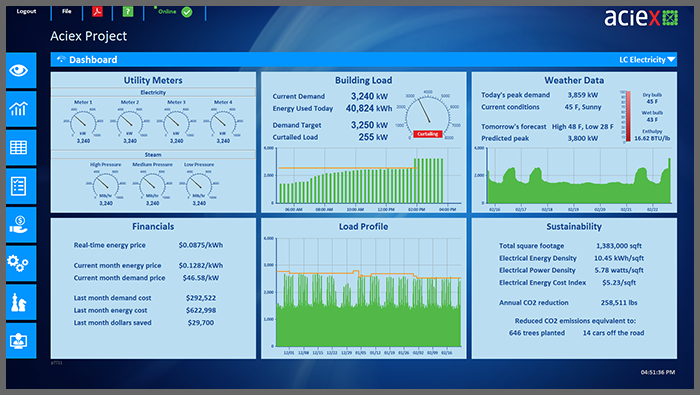 Emacx energy management solutions empower users to intelligently manage their energy consumption, adjusting both the timing and the quantity of their electricity use in real-time, without degrading mission critical operations. Emacx customers realize lower energy costs by having the ability to automatically shed facility loads to avoid expensive demand charges and by installing new control devices such as variable frequency drives for improved energy efficiency. Emacx customers also typically participate in lucrative utility Demand Response programs to generate additional revenue for load curtailment during times of peak generation demand on the grid. Our Aciex energy management platform goes beyond basic energy conservation measures (ECMs) to deliver the full spectrum of energy management tools needed to cope with the current complexities of energy management strategies such demand control, demand response dynamic or real-time pricing, controlling renewables and distributed energy resources, or micro grids.